Mary Beth Hertz, the founder of edcamp, on how to host your own edcamp. Editor's Note: Blogger Mary Beth Hertz was one of the organizers of Edcamp Philly, a free education "unconference" that took place in Philadelphia last May. The event attracted the attention of educators from around the world--not only for the excellent content and collaborative spirit, but also for the unconference model itself -- one that costs next to nothing to produce by facilitating ad-hoc community participation. Since then, groups of educators around the world have begun to organize local edcamps in their areas. 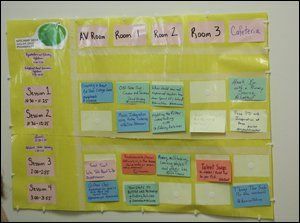 In this four-part series, Ms. Hertz explores the edcamp model, and shares some tips on how to organize and host an edcamp unconference. The organizers of edcamp Philly attended BarCamp Philly in November 2009. This experience sparked our passion for the unconference model and inspired us to share the model with our colleagues in education. We immediately began considering what the basic principles of the day would be, who would come, how we would get the word out and how we would 'market' it to educators. We reflected on our experiences at BarCamp and did some research on the model to make sure that we what we were offering was truly and unconference and was truly attendee-driven. Since edcamps are derived from this model, we follow the same basic guidelines. Unlike traditional conferences, sessions are not planned or scheduled until the morning of the event using a scheduling board on which attendees can place an index card with their session on it. The sessions range from basic conversations around teaching methods to sessions sharing digital projects by students or sessions based around just having fun. Most BarCamps have a technology focus, and many edcamps include sessions about using technology in the classroom, but a technology focus is not necessary. However, it is suggested that you bring a laptop to an edcamp as many presentations will be interactive and there is usually a heavy backchannel conversation going on. It is also a great way to be two places at once when you want to attend two different sessions at the same time. When thinking about who would attend edcamp Philly it was clear that we wanted a varied group that included classroom teachers, instructional coaches, administrators, colleagues and others. We were excited by the opportunity for a wide variety of people in education to be in the same room discussing their ideas and passions. One of the best parts of an unconference like edcamp is that it creates a level playing field for discussion. Since the attendees drive the conference and the attendees also serve as presenters there is no hierarchy between presenters and attendees. Teachers can present in front of administrators and administrators can engage teachers in dialogue with both parties taking an active role in the discussion. One of the most exciting and challenging aspects of putting together an edcamp is that they are 100% FREE. Technically, an edcamp should not require any funds aside from some name tag stickers, index cards, paper and some markers. However, there may be a need to secure a venue and/or wireless connection and of course it's always nice to be able to provide breakfast or tee shirts, so you may want to find sponsors. Later blog posts will discuss sponsorship, but keep in mind that edcamp unconferences, as ad-hoc gatherings, do not require the bells and whistles of a traditional conference.